SKU: sjs06. Category: Canvas Print. This pictorial biography symbolizes the artist’s personal journey through adolescents to find her identity, belonging and purpose. This young sea turtle navigates its ocean course from the Southern Cross. The intricate line work honours the cultures and people from the Pacific and Torres Straits. The Southern Cross doubles as the starry constellation and the wounds of Christ crucified. The turtle represents a young person journeying through life. 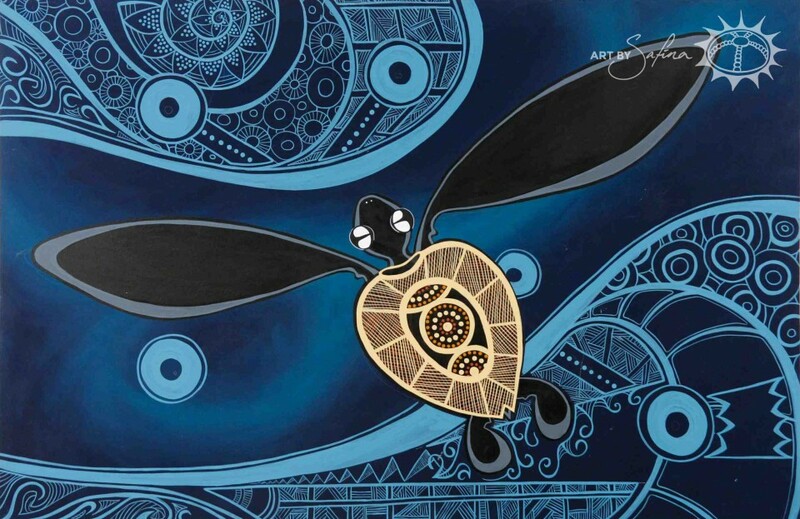 The story of the turtle takes on a personal statement when the two messages are overlaid – Just as this young sea turtle navigates its ocean course from the Southern Cross, the artist navigates the oceans of life with her eyes fixed on Jesus as her guide.